Remember this hunk of a model back then? A summary of all the Ipoh food I have written before revealed the rather unflattering truth; I REALLY need to push on and write more on other cuisines, especially Malay food, and Indian food. The smattering of knowledge with regards to the existence (or the lack) of worthy Malay restaurants, ‘warung’, or even roadside shacks in and around Ipoh, renders my search for blog-worthy materials close to futile. But thanks to the encouraging (notice I used the word ‘encouraging’, instead of aplenty) number of Indian colleagues and friends, I am slowly getting accustomed to the myriad of Indian cuisines in Ipoh, from the classy North Indian food, to the spicier and robust South Indian fare. Read all about the banana leaf escapades for a gastronomic journey of the most fiery kind. Chicken Kothu Parota – A mish-mash of ingredients, cooked on the hot pan peppered with acrobatics courtesy of the ever-eager Indian staff (you have to witness the preparation steps to fully appreciate it) and a whiff of spices, resulting in a most complicated ensemble of flavours. Routinely, I went for the usual outings to Indian restaurants to appease the irregular cravings for something spicy. But nothing short of the common Roti Canai (and the endless variations such as Roti Planta, Roti Telur, Roti Bawang), Capati, or Thosai, for the limited knowledge of yours truly, paired with the average Mamak stalls/restaurants serving more or less the same lackluster selections. But at Sri Ananda Bahwan (let’s call it SAB for short) serves a different type of Indian food come dinner hours. For they have a separate Evening Special menu, featuring a list of mind-boggling and practically unheard of items. 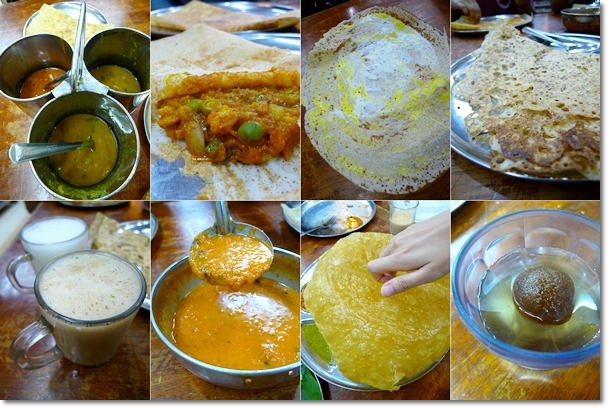 Dishes such as the more familiar sounding Idly, Masala Thosai, and Poori, to the vaguely familiar Uthappam, and down to the almost alien-sounding (to me, at least) Idiyappam Baya, Adai Aviyal, and Kothu Parota. Having problems pronouncing them? No fret, so do I. But the staff at Ananda Bahwan were always pleasant enough to explain in whichever language they could muster (sign language included! ), to get their messages across. Do take note that some of the workers are not your typical English-speaking Indians, so be patient. Among the evening specials I have personally tried, the Kothu Parota (or Kothu Paratha) is a most delicious option, consisting of a mix of finely-chopped onions, eggs, paratha bread (or Roti Canai, to you and me), green chillies, potatoes, and your choice of chicken, or mutton (there was also a vegetarian version available), fried with what seemed to be curry powder, salt and whatever spices they threw in. The result? A most luscious, savoury and filling plate of Kothu Parota, served with some pickled and dyed-red sweet onions, and a steel cup containing yoghurt with julienned cucumber, carrots and raw onions. Close resemblance to the Chili Paratha I had in Karaikudi in Penang. The Rava Thosai is a light, crispy piece of Thosai served with some sides of curry, dhal, and chutney. The most noticeable difference between this and the usual variety is the many holes in the dough, and the crispy, almost snack-like quality of the Rava Thosai. The Special Masala Thosai came with loads of curried potatoes, ensuring an intensively carbo-laden meal, and a darn filling one to boot. The usual sides of curries, dhal and chutney completed this set. The Poori at Ananda Bahwan is less oily when compared to Kalai’s, and finishing the two pieces in the set was not much of a hassle. The dhal curry (lentils cooked with spices) accompanying the Poori was top-notch, but sadly served cold. To finish off the meal, I like to wash them all down with a cup of Teh Susu Lembu, or Cow’s Milk with Tea. 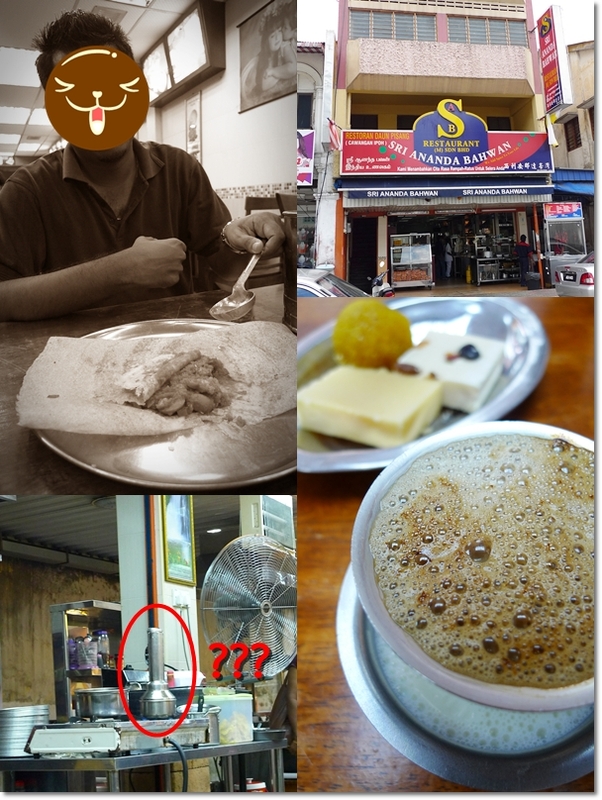 Or for a different caffeine experience, try a serving of their popular Madras Coffee (refer to my old post). Yes, you may walk out feeling like you’re about to burst, when your diet plans go haywire, and you ended up pointing to almost every single item on the menu. But a dinner here will not break a hole in your pocket, with the average items costing less than RM5, except for the Tandoori items, or Special sets. Tel No : +605-253 9798 or +6012-477 5981. Directions : If you know where Sin Yoon Loong and Nam Heong, the famous coffee shops in old town of Ipoh serving the most original white coffee, then you can locate Sri Ananda Bahwan easily. From Jalan Bandar Timah (a one way road), once passing by Sin Yoon Loong coffee shop on your right, and Nam Heong on your left, turn right into Persiaran Bijeh Timah. Sri Ananda Bahwan is on your left. Notice that there are TWO Sri Ananda Bahwan in the same row, a few shops apart. One being the original shop with no air-cond, while the other is fully air-conditioned. Delicious Evening Special Menu, with Indian delights never heard before! 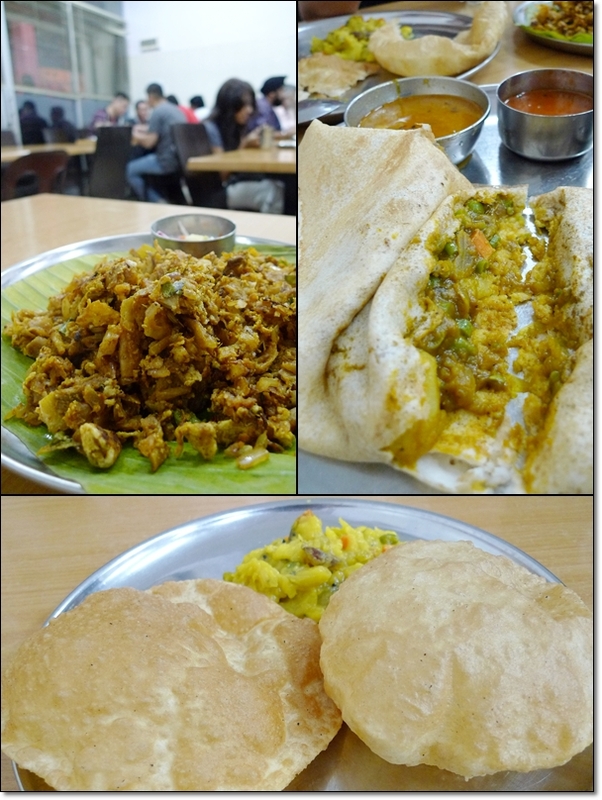 The Kothu Parota is scrumptious, the Poori light and tasty, while the Masala Thosai is heavenly…. looks like a normal mamak store to me..
but hey since you mentioned it, i might just try that one day! .-= kenwooi´s last blog ..Launching Banner FAIL =-. 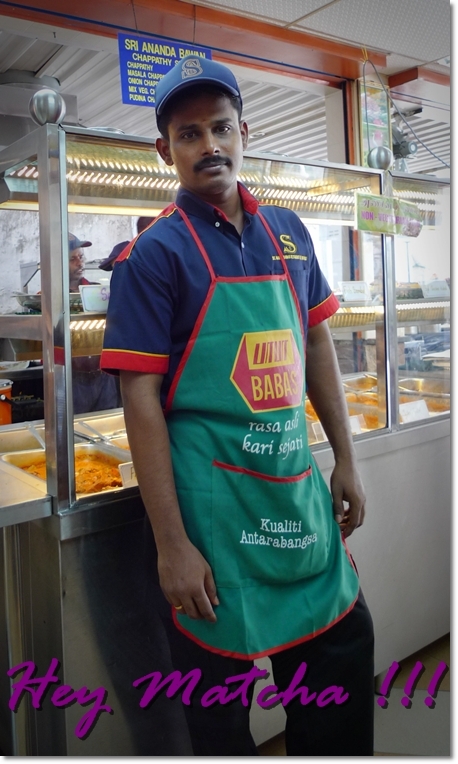 i love their rawa thosai here…..
Haha. That Indian chap really posed for u eh. 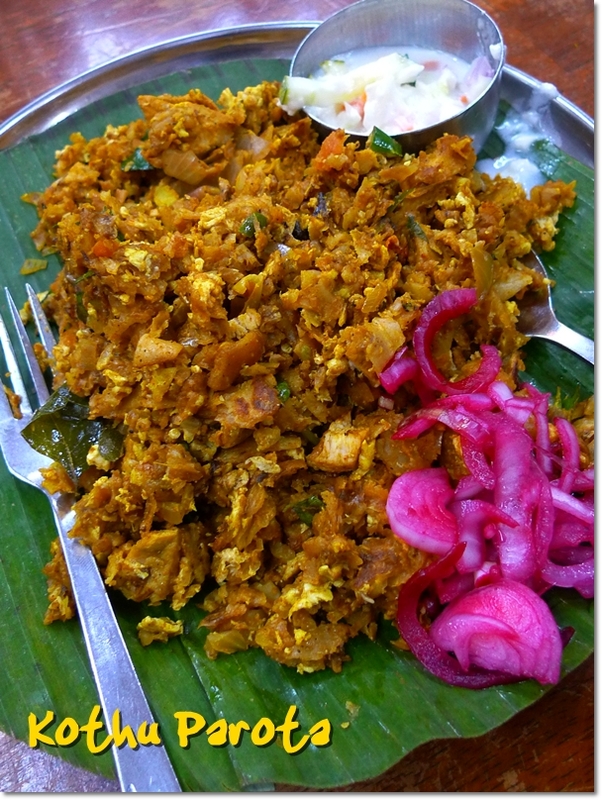 Am trying to memorise kothu parota to order. . cheh maybe I shd just snap your pic on my mobile to show! My new found love is Rawa Thosai. I’ve never heard of Kothu Parota before. I will try it when I have the chance. Looks really delicious. .-= Che-Cheh´s last blog ..Teluk Pulai (Claypot) Bak Kut Teh Restaurant @ Taman Intan, Klang =-. J, we r going to try this tomorrow morning.. we overlooked this shop… always seem to be going chennai and lotus only.. so.. tomorrow if u see 2 aunties eating capati there, u will know it is us.. lol..
but the evening special menu only available for dinner. the fried bitter gourd in their line of dishes for lunch is rather famous. Oh it’s ok … I was digging into a plate of Char Koay Teow myself, on Friday morning. Indian food! I think there is a branch in BM/Butterworth? I saw it when i take the bus back to Pg..I noramlyl get down at the ferry in Butterworth. there’s even a branch, or maybe branches in Penang. i <3 <3 <3 roti canai goreng! yupe, they do put in some curry powder and sometimes, sambal as well. heck, i even saw them putting the pack of flavouring from that instant noodle brand once..hahaha. but not every Mamak stall serves this dish. some even gave me that confused look when i ordered. i guess that's the difference between the good and bad ones la. .-= Nic (KHKL)´s last blog ..Nippy Noodle Restaurant =-. niways, lurve lurve lurve roti canai goreng. there’s a bit of everything in it! and yes, it’s curry powder. i had some with that pack of perencah from maggi too. delish! yes ah?!! you fried your own? delish stuff. esp when you bite into the bits and chunks of meat. and the crunchy, sweet onions. if only they serve them during the day, for breakfast or lunch. .-= allie´s last blog ..Christmas Lunch Buffet at The Brasserie, Traders =-. yeah, its in Penang as well. i think there are several outlets there in Penang. Psst! Saw this featured in your blog before and actually went there for a visit days later. One look at the menu and I broke down in cold sweat. All so foreign to me. So I ended with the roti canai instead. .-= ahlock´s last blog ..What the Inventor of the Flu Shot NOW Thinks of the Vaccine… =-. hahaa, just point away lah and order. they do have the usual roti, chapati and thosai of course, not to mention the curry and rice, mee goreng, tandoori and naan, etc. .-= babe_kl´s last blog ..Review: Kedai Makanan Mun Wah Hokkien Mee =-. .-= iamthewitch´s last blog ..Hong Kong Day 3 – Australia Dairy Co., Times Square, Maxim MX, The Peak & Blue Girl Beer =-. Oh, I love indian food.. especially their curry mutton… they cook really good curry :). And their thosai is yummy~ goes really good with their coconut chutney :). .-= ladyviral´s last blog ..Birthday for Mommy – TGIF =-. yeah, thosai is a light meal, and rather healthy in itself. plus the slight tinge of sourness offsets any feeling of ‘jelak’ after the meal. lest you’re downing plates after plates of Rotis like me, then thats a different story altogether. what is Poori made of? it can be likened to a version of UNhealthy Chapati. hehe, it’s crispy, deep-fried dough/bread with lots of trapped air in the middle. but goes very well with dhall, chutney, curries, or whatever else. Kothu Parota never come across a name like that in mamak..
it’s not that common. I still remember I tried to order that in Kanna Curry House, Section 17, PJ and I got blank stares. LOL. .-= Life for Beginners´s last blog ..How We Met =-. In Malacca, we don’t have a lot of these Indian shops. Ha 😀 The utensil…hmmm…looks very familiar. They use it to make Putu? Yeah, the torchlight-like apparatus is used to cook Putu. or so my friend said. Have you tried their buttered chicken? Available from 11:30am onwards. yes, I have tried the rice with masala chicken, butter chicken, fried bitter gourd, etc. why don’t you DHL something else in return? wherever you are now! Indian food kind of contained in its own enclave for many years due to the conservative Cantonese who preferred their food stir-fried, pan-fried lightly and steamed. Lead the way.